MADRID, Spain (CNN) -- Court hearings began Friday for 11 people, including two Spanish professional football players and a Serb-French football agent, who were arrested this week on charges of cocaine smuggling, a police source told CNN. Spanish police allege the group smuggled the drugs in from Argentina. The 11 are accused of taking advantage of their football contacts in Latin America, and their trips to the region, to organize the drug trafficking. 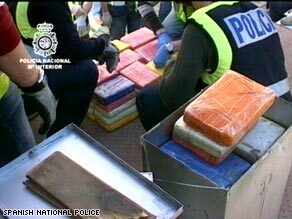 Spanish police made the arrests on Thursday, mainly in Madrid, and seized 600 kilos (1,320 pounds) of cocaine they alleged had been shipped from Argentina to Spain earlier this month. The suspected leader of the group was identified as Zoran Matijevic, a Serb-born football agent, the international football federation, who now holds French citizenship, according to a police statement and the police source. His aides in the alleged scheme included Pedrag Stankovic, a former player on the second-division Hercules team from Alicante in southeast Spain; Carlos de la Vega Diaz, a current player for the second-division Rayo Vallecano team in Madrid, and Pablo Acosta, a football agent, according to the statement and the police source. The investigation began in the middle of 2008 after police began to notice a group running drugs from South America to Spain. A container with 45 packages of cocaine -- linked to the suspects -- was hidden in wind farm machinery. It left an Argentine port in February, stopped in Tangiers, Morocco and then crossed the Strait of Gibraltar, docking in the southern Spanish port of Algeciras. The cocaine container was finally driven by truck to Madrid, but before the suspects could get the cocaine and distribute it, the police moved in, arresting seven suspects in Madrid, three in the southeast port of Valencia and another in Alicante. The suspects include a Peruvian national, the police statement said. Authorities say Spain --- with its extensive coastline on the Atlantic and the Mediterranean -- is a major point of entry for drugs, for use in Spain or to be shipped elsewhere in the European Union.